FreePianoLessons4Kids.com? Piano lessons can be very expensive and time consuming for busy homeschool moms (driving to and from lessons, etc). So why not start learning for FREE from an actual music teacher from the comfort of your own home? I had tried learning the piano at an early age but became bored. My teacher wasn't very engaging and I felt I was only learning music history (composers, etc) and theory and not really learning how to play the piano. FreePianoLessons4Kids.com teaches how to play while teaching about theory, etc at the same time...plus the videos are very engaging. Don't worry if you don't have a piano a keyboard can easily be used as well. So what does this site offer? 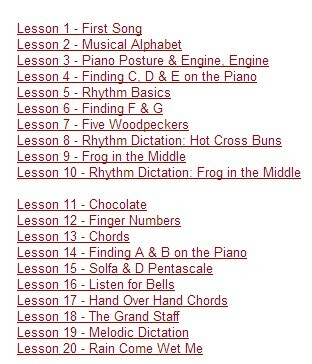 FreePianoLessons4Kids.com offers FREE video lessons on their website. YES 100% FREE...there are no catches. I previewed a few of the lessons and they are fabulous and great for kids of all ages and even adults. The lessons are fairly short and there are 53 in all. Some of the lessons include. 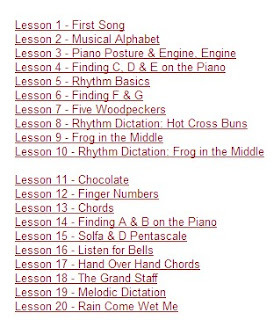 Besides learning to play the piano you will also learn correct play technique, posture and hand position; how to read and write notes on the grand staff (treble clef and bass clef); how to read, write and perform rhythms; basic music theory including chords, key signatures; and more!!!! If you wish to download the additional activity pages, sheet music, practice instructions and an mp3 listening album which corresponds to the lessons there is an additional charge for these. I had a chance to review these as well and they are both fabulous resources. Right now the complete download materials for lessons 1-41 (64 pgs) and the listening album w/parent's guide are on SALE for ONLY $19.00 order here. www.FreePianoLessons4Kids.com was launched 3 years ago by pianist and veteran music teacher Joseph Hoffman (MM), as a way to make quality piano instruction available and affordable for anyone. Concerned that too many kids were missing out on music lessons because of tough economic circumstances, Joseph decided to offer his lessons online for free.Our site now has 50 lessons live, with over 1 million total lesson views. The lessons are geared for ages 5 to 10, but I've also heard from many adults and teens who enjoy using them. The lessons are simple and fun, yet also thorough, covering all aspects of a solid musical training, from square one—no prior musical experience is required. 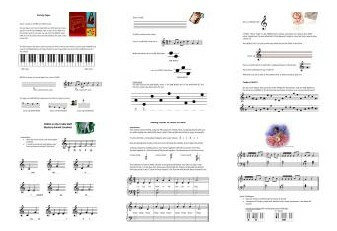 www.FreePianoLessons4Kids.com has graciously offered to giveaway 3 copies of the Materials for Lessons 1-41 w/the Listening Album (downloads). Only the first entry is mandatory. Other entries are optional and give you extra chances. This giveaway is not affiliated with Facebook in any way. The winners will be posted on the blog and will be emailed. Winners must reply within 48 hrs with their contact information or another winner will be chosen. Prize will be emailed to the winner by Free Piano Lessons 4 Kids. Hmmm, my favorite instrument is probably the guitar. I've always wanted one of my kids to play the piano though because my mom has played since I was little. I love listening to so many instruments, but I love the harp and the xylophone. My fave instrument is piano. I love listening to it but would love even more if I could play! This is a great resource! Thank you! My daughter was taking lessons, but we can't afford right now. The piano. I've played since I was about 6. I love the banjo & mandolin - hoping to learn one this coming year!! I love piano and would love to learn with my kids! I'm so excited to win!! Thanks for the giveaway!